Raymond Engineering and Holland & Holland General Contractors worked together to form a design-build team for the re-roofing of approximately 12,000 sq. ft. of Building 1905, 165th Air Control Wing, Savannah, Georgia. This building is used by the flight wing for office space and meetings. 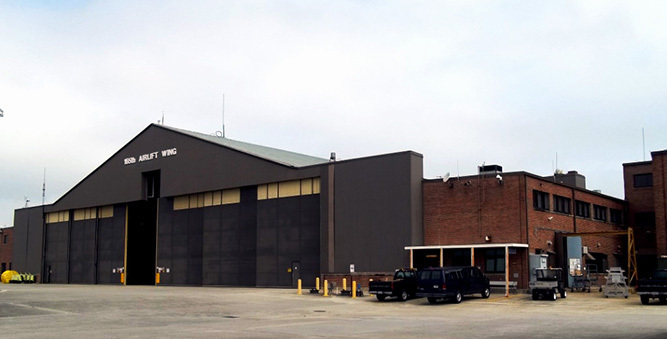 Although the building was re-roofed less than ten years ago, persistent leaks have been a problem; partly caused by the amount and speed of water that runs onto the low-sloped roof from the steep-sloped hangar roof, along with poor flashing conditions where the metal roof system intersects walls. During our investigation, it was determined that the existing gutter, downspout, and underground drainage system were under-designed. 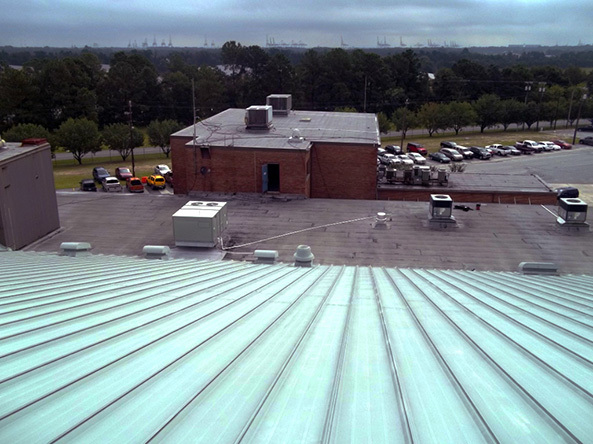 Raymond Engineering performed a detailed investigation of the roof assembly and developed comprehensive drawings and specifications for the re-roofing of the facility. 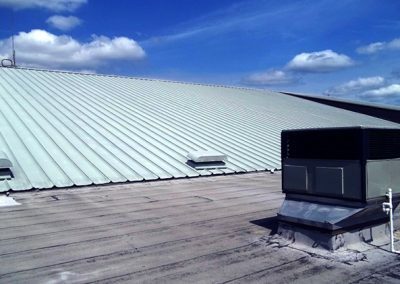 Our design included instructions for resolving metal roof flashing issues at walls, roof-mounted equipment, transitions between the metal and low-sloped roof areas and a re-design of the gutter, downspout, and underground drainage system. There were several issues that had to be resolved during the design development phase of the project. The flashings and flashing heights were very limited at the juncture of the metal roof, low-sloped roof and all walls above roof level. There was very little flashing height for the installation of base flashings at the transition of the metal and low-sloped roofs, as well as the large amount of turbulent water that could result in very significant interior leaks. 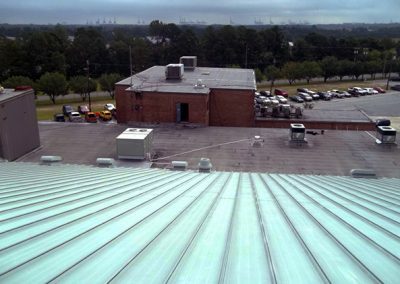 As a result, Raymond Engineering determined that a three-course fluid-applied flashing system would be installed along with an eave flashing; wall panels would be trimmed, existing flashings removed, and new flashings installed that would provide better protection against water infiltration. The initial scope of work was to remove the existing metal deck and install new decking. However, Raymond Engineering found this unnecessary and determined that most work may be limited to the removal of surface rust and the application of metal primer. This change has resulted in a cost savings to the building owner of approximately $100,000.